Personalised Roblox T-shirts, Smix Starts a Trend! I've always thought Minecraft missed a trick by not making available merchandise such as toys, t-shirts, duvet covers, pencil cases, quick enough on the market to take advantage of its huge popularity. I remember having to order Minecraft things people had made themselves on Redbubble for Christmas presents, because the big shops had very little on offer. Had Minecraft had been quicker & more savvy, they could have flooded the market with merch and made a fortune. I wanted to give them my money but there was nothing to buy! As it is now there is the Lego, some wildly priced tiny figures, and a couple of shops with the liscence to sell t-shirts or hoodies. But now the kids have moved on and Roblox is the game of choice. For us adults, I'll explain. Roblox has lots of mini-games created by other users. Some games have thousands of players in their virtual world, some are smaller. My son plays & enjoys these high quality games, but he also loves the feature in Roblox where you can put together your own landscape, with houses, trees, cars etc. & then he invites his friends to enter his games & play there. So it's a little like Minecraft, but a step on, so it's perfect for anyone over the age of 8 (you must be that at least to play). Roblox seem to be more on the ball than Minecraft, and they've already released a range of toys. There are characters from the most popular games, and a line of 'blind bag' figures with 40 to collect. But as yet I haven't spotted any Roblox clothing in the shops. Again there are sellers on Redbubble who take images from the game & will print those on a tee for you, but we came up with a more personalised idea, which is cooler than just having the Roblox logo on your shirt. We were visiting Portrush this week, where there are shops who will print any image on a tee for you. You just bring along your image you want, and they can print it off their computer onto transfer paper which then goes on the colour of t-shirt or hoodie you pick. Smix originally wanted an image from searching on Google that said, 'Eat, Sleep, Roblox', but the guy in the store said it wasn't good enough quality to work. So we puzzled over what image would work & Smix came up with a good idea. He brought up his Roblox character profile and there in the 'about' section is a great quality pic of his avatar. 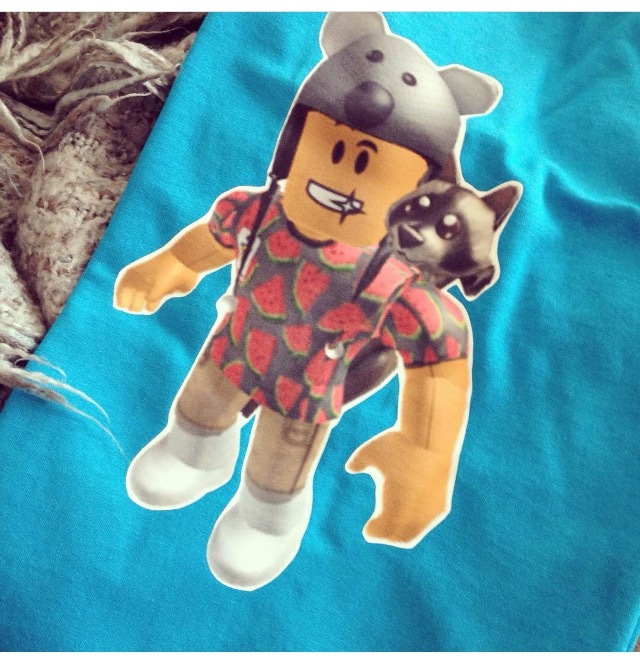 So not only was he getting a Roblox t-shirt but it was mega personalised as it was his character in the clothing it wears when he plays. An Instagram friend loved it, and the next day they took a trip up and he got one printed too. So if your child would love one of these too, you can have T-shirt World print your character too, as they offer an online service. On their site you will find their email address. They will need your child's age for sizing, whether you want a tee or hoodie, or any of the other personalise items they offer, the colour to use, and the image of your Roblox character. To get that all you have to do is Google 'Roblox' plus their username they play as. The first result should be their profile page which will have the good quality picture of their character. If you are confused by that, you could always just send him your child's Roblox username and he will know how to get the character image from that info. Other local printers from your town could also make these, but we like T-Shirt World because the clothing is great quality, the hoodies don't bobble and the colours are so vivid. Plus Alan from the store will know exactly what you're talking about when you request a Roblox user print. 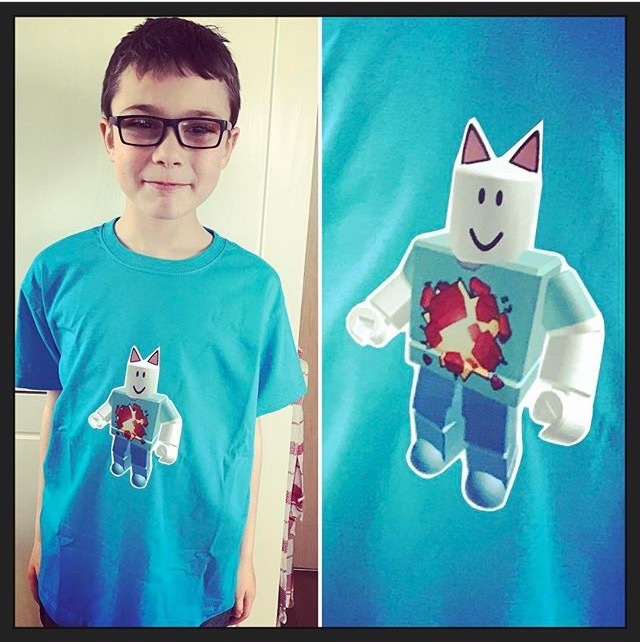 So visit T-shirt World online and order your child's personalised Roblox tee today! Who would have thought Smix could start a fashion trend!